Join CPTV, the Yale Film Study Center, and La Casa Cultural: The Latino Cultural Center at Yale for a special screening and discussion of Dolores, a new documentary by Peter Bratt. 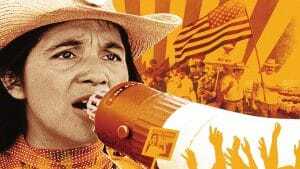 When: Thursday, March 8, 2018, 7-9 p.m.
With intimate and unprecedented access, this film tells the story of Dolores Huerta, who is among the most important activists in American history. Co-founder of the first farm workers union with Cesar Chavez, she tirelessly led the fight for racial and labor justice, becoming one of the most defiant feminists of the 20th century. Dolores will air on CPTV as part of the Independent Lens series on Tuesday, March 27, 2018 at 9 p.m. Featuring upcoming documentaries from the Peabody Award-winning PBS series Independent Lens, Indie Lens Pop-Up brings people together for film screenings and community-driven conversations. Indie Lens Pop-Up is presented in Connecticut by CPTV, the Yale Film Study Center, ITVS, andIndependent Lens.